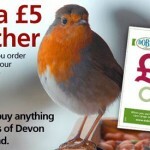 Food for the Birds founder Andy Darley explains why this website was set up. You could say this website has been 30 years in the making… here’s the story of how it came about. Back in the 1970s, when I was small and had probably been watching too much Blue Peter, me and a mate called Brian Kilroy decided to set up a society called ‘Food for the Birds’ to encourage people to put out scraps over the winter. In the first few days of enthusiasm, we hand-drew a couple of ‘FFTB’ posters with crayons and got permission to put food on the school bird table, then began to make lists of the birds that visited it. Our good intentions didn’t last long. We stuck the first poster onto a telegraph pole in my street using drawing pins, and a neighbour immediately came out to tell us off for putting up signs without permission. He relented when he saw what it was for, but the rain soon ruined it anyway. And a fearsome dinner lady called Mrs Gittins chased us away from the bird table, refusing to believe we had the headmaster’s blessing to use it. So that was that – Brian and I drifted apart, as friends do at that age, and I’d be surprised if he still remembers me, let alone the short-lived FFTB. But now I’m old enough to have a house of my own with a garden, visited by birds that need feeding. And, more importantly, I’m a web designer with access to tools far more powerful than that old box of blunt Crayolas and notebook made of stapled-together scrap paper. So this is the result – FFTB reborn as a website where you can get advice about what food to put out and when, jump off to useful sites such as the RSPB, and where you can browse and buy exactly the right sort of food for the birds in your area. It’s been a bad few decades for British garden birds, with all sorts of species in decline. This website is my small contribution to helping them fight back.